1. If you are a JKC member ages 6 to 12, send in a 4r photo of you taken during a recent JKC workshop or activity. 2. Answer this question in two to three sentences: What’s the best thing about being a JKC member? 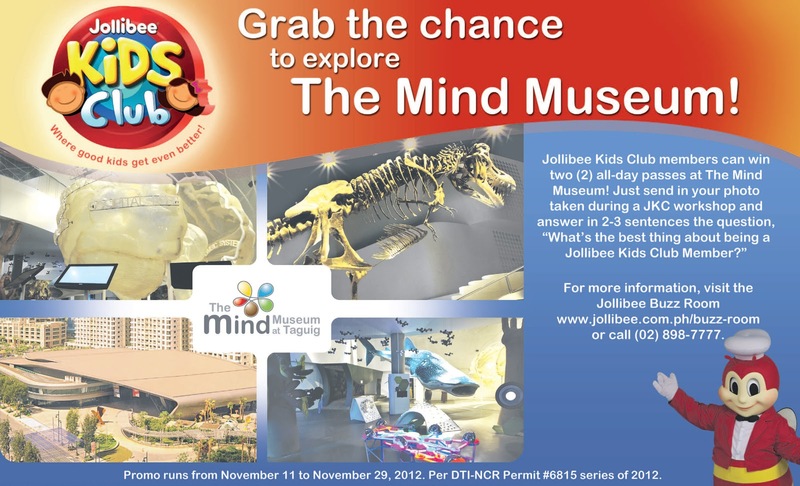 Chosen entries will win two (2) free all-day passes to the Mind Museum for a fun-filled learning weekend at the first ever world-class museum in the Philippines, plus free lunch and snacks c/o Jollibee. Winners will also get P1,000 worth of Jollibee gift certificates. Hurry! Deadline for submission of entries is on November 29, 2012. Promo period is from November 11 –November 29, 2012. Per DTI-NCR Permit # 6815 series of 2012. For complete mechanics, visit the Jollibee Buzz Room at www.jollibee.com.ph/buzz-room. The Jollibee Kids Club is the biggest kids’ club in the country, with exciting activities for kids. Parents can sign up their children for a JKC membership at select Jollibee branches. 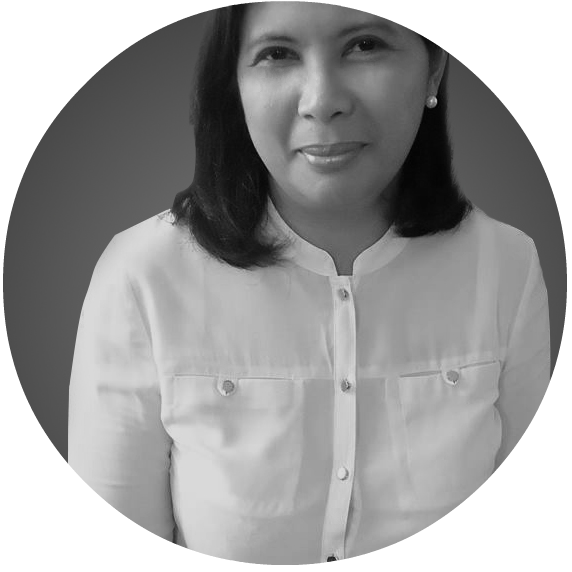 For inquiries, call (02) 898-7777. The mind is a complex system of mental faculties that include thinking, reasoning, judgment, perception and consciousness. It is actively used in understanding scientific principles and facts. The Science Mind presents more than 250 interactive exhibits by interconnecting stories of Atom, Earth, Life, Universe, and Technology. The museum's main thrust is science discovery. In science learning, all the mental faculties are used. It allows the mind to understand the past, comprehend the present, and anticipate the future. Given the choice between a day spent idly and a day spent learning while having fun, I'd choose the latter any time. Children of today are badly in need of more productive activities that enrich the mind and encourage them to think of possibilities. What better way to get such an invaluable experience than to get it for free. That said, join now as the deadline for submission of entries is merely six days away. 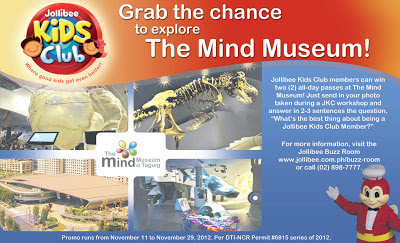 The chance can be yours to explore Mind Museum through Jollibee Kids Club.